Several years in a row Tse Ming Chong, Founder of Lumenvisum, asked me to participate in the Artist and Photographer Conversation Series. My routine response was that I had no time and was not ready. Indeed, I had a fairly busy schedule when I first relocated back to Hong Kong. Yet the main reason of my rejection to his proposal was my fear of having to delve into my old work or to make art for a predetermined project. I began seriously taking pictures in the summer of 1990 and have collected tens of thousands of images ever since. The film cameras that I have tried range from Minox subminiature camera, Diana box camera, Seagull/Pearl River twin lens reflex, Nikon SLR, Mamiya RZ67 to Calumet and Graflex Speed Graphic. A photographer’s working method to a large extent reflects a technique as much as a temperament. I eventually settled on a medium format film camera. I like to explore the world and see it through the viewfinder. My photography heavily relies on the intuition of my trained eyes, my sensibility, and the spontaneity of the medium. I already know the picture when I pick up my camera. The moment I click the shutter I feel that my role as an artist is fulfilled. The resulting image is no longer important to me, and it doesn’t matter if it will have an audience. It has become the norm that in most cases my images either occupy the space in my storage unit or quietly reside somewhere on my computer hard drive. Last year, I finally decided to accept Mr. Tse’s invitation to participate in this conversation project. Through several dialogues with Stanley Wong, I discovered that we share similar interest in our complex cultural and visual environment. We incessantly photograph the streets of Hong Kong, without a project in mind. Other than the excitement we have at the time of the exposure, we are both left with heaps of untouched negatives. For the exhibition, I reviewed the images that Stanley Wong provided to me, and selected some to pair with my own work. My work shows a more open view of the scene whereas Stanley’s is relatively closer and, in certain occasions, focus on an object. Despite those differences, each pair shares certain connections or similarities to one another, either visually or conceptually. I intentionally present the two images very close together, imitating the format of stereoviews, which is how the exhibition title originated. I hope each pair of two-dimensional images is seen and then combined in the mind of the audience to give the perception of three-dimensional depth. When the viewer moves between the two images within the pair, they would feel as if they could zoom in and out of the scene. 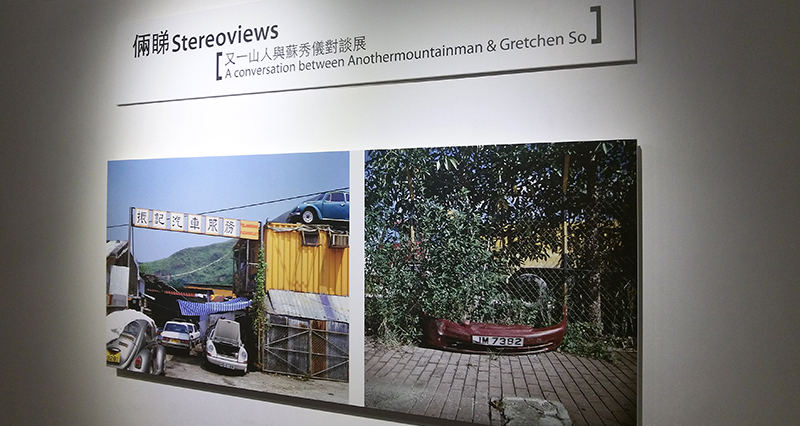 I thank Lumenvisum and Mr. Tse Ming Chong for organizing this exhibition, and for letting me rediscover my work and see it in a way I had never seen before.